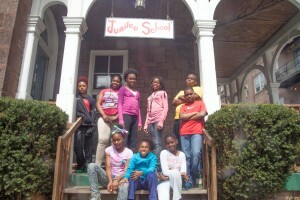 Jubilee has formed a connection with a Latino arts and culture organization in North Philadelphia called Taller Puertorriqueño. Taller is partnering with the African American Museum in Philadelphia to raise money and gather supplies for Puerto Rico in their time of need. Since Jubilee is also connected to AAMP,this would be a great opportunity to support both Puerto Rico and two organizations we have relationships with, by raising funds as a Jubilee community. joins a coalition of community organizations, leaders, and advocates to raise funds to support storm-ravaged Puerto Rico under the banner of Unidos PA’ PR. Together, we want to do everything possible to draw attention to the crisis and support Puerto Rico in the relief efforts in the aftermath of hurricane Maria. Right now in Puerto Rico, over 3.5 Million Americans are without electricity and running water, and thousands of people are in shelters. Considering the deep roots of Philadelphia’s Puerto Rican communities and neighborhoods, and Puerto Rico’s important place within the larger narrative ofthe African Diaspora, AAMP implores your to take action to help our affected brothers and sisters today. If you would like to send money instead, checks can be made out to CONCILIO / UNIDOS PA’PR. You can also bring cash. We’d like to deliver the funds as a contribution from our Jubilee community. 1. We, the children demand a great, well focused, equal education for children all around the world. We believe in children. We believe that children can change the future and transform people’s lives. We propose that education should take us to a new level in life, so that we can make history, be leaders and make our ancestors proud. 2. We, the young, Black representatives, protest about how history is taught. We believe that children should know all of their history. They should know what their ancestors have been through and how they were powerful, fought back and got their freedom. We recommend that children should not only learn about one side of history. We should learn the heart of history. We need to know the truth about what came before so we can know who we really are and what we were brought on earth to do. 3. We the children stand by what we are sure of. We have many generations after us and we don’t want gun violence in our world. We demand strict gun laws everywhere. We refuse to let innocent people get put in graveyards by guns. We recommend that assault weapons should only be used by the military. We demand that game companies stop making violent video games because they brainwash children’s minds. We want a gun-free world. 4. We demand that the government stop building more jails and build more schools. A large percentage of people in jail are in there because of drugs. We protest against drug users going to jail. If people are doing drugs, they’re hurting themselves. We’re demanding that drug addicts not be sent to jail, but be sent to rehabilitation centers so they can put their lives back on track. The more rehabilitation centers, the less prisons there will need to be, and the more money there will be for schools. Think about the children and how we are responsible for the future. 5. We the people demand justice in the courts for all plaintiffs and defendants. We demand to have a mix of races and genders on the jury. A fair trial is when the judge and jury try to understand both sides. We the people of color complain that more Black people and Hispanics are being prosecuted in the courts than whites. We demand that all punishments for breaking the law should be the same for all races and economic classes. 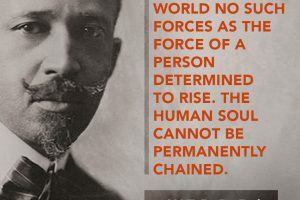 We the darker people all through our lives stand up for what we believe in. 6. Our people have suffered through segregation, prejudice and racial profiling. We, the young Black freedom fighters demand that this should stop now. We need a new slate that involves all people coming together as one. We, the people of the Black community have the right to the same opportunities as all people, such as a great education and any job we’re eligible for. We deserve to live in a world without being judged or mistreated for how we look, how we wear our hair and clothes, or where we come from. Our people will fight for justice until everything is fair. 7. We the children represent our future. We are connected to the earth. We challenge the government to tell corporations to stop cutting down trees, polluting the air with gases from factories, polluting the water with oil and putting chemicals in food. We urge people to recycle and reuse. We recommend that people use buses, bikes and electric cars to save energy and reduce pollution on the earth. We the people need to stop global warming or the icebergs will melt and our earth will flood. 8. We the children demand that there be no more war. It is hurting us to see children and adults getting killed. We want no chemical weapons and bombs. Children should have the right to live safe from violence or hatred. We do not need to be introduced to violence as soon as we’re brought into the world. We the children have made a decision for less violence everywhere. One day children will come together for freedom from war. We deserve a better life than this. 9. We believe our whole world should be connected because we share the earth together. Everybody in the world should be equal and connected like next door neighbors. We recommend that all the countries should put their differences aside, and think about how they could make the world a world without violence, poverty, hunger, pollution and global warming. If everybody was working together our world would be a powerful planet of peace. 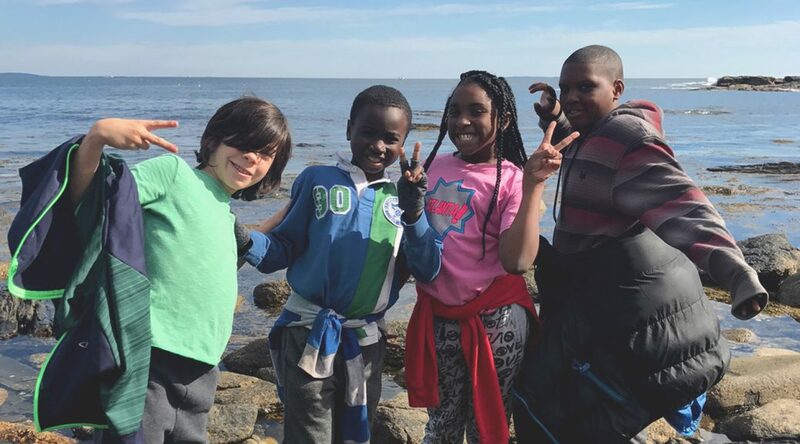 Every October, a group of fourth, fifth and sixth grade students take a five day trip to a leadership camp in Maine called Camp Kieve. The growth that takes place over those five days is wonderful to observe. Students learn principles of communication, leadership skills and how to deal with peer pressure. 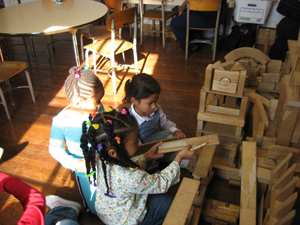 Each day they are given a “challenge” activity involving group problem solving. After the activity they discuss how they function as a group in terms of the principles they learn. They are also challenged to overcome fear, and to trust themselves and their team-mates through a ropes course. One of the favorite activities is called “solo time”. In this activity, students find a quiet place by the river, and reflect in their journals about what they are learning, and how it will translate into setting goals for themselves. 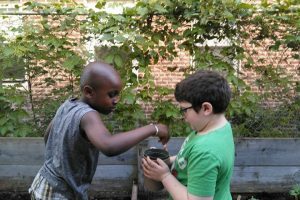 The Leadership School’s curriculum fosters risk taking, cooperation, and mutual support. Students, along with parents and teachers (who travel with them), will deepen their sense of community and learn to be leaders of the school. Jubilee School Founder & Director Karen Falcon says the path to true reform, starts with a focus on the children. Falcon is the first in a series of profiles by journalist Manuel McDonnell Smith about people in Delaware Valley making a change by putting into effect good ideas. Nominate your “good idea” subject on twitter @manuelsmith. Jubilee Alumni, Aziz Kane, has been creating sculptures with wire for over a year. 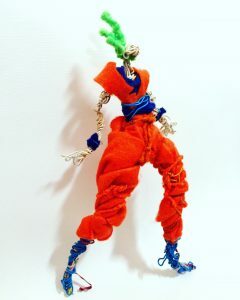 Aziz began creating wire figures in 2016. 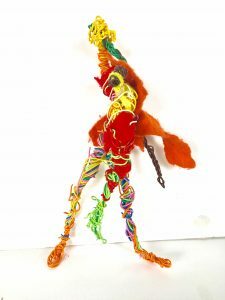 As a way to keep his hands busy in class, Aziz began twisting colored wire into figures based on Anime cartoon characters. Since then, Aziz has built a collection of expressive figurines – fashioned with wire, masking tape and pipe cleaners. 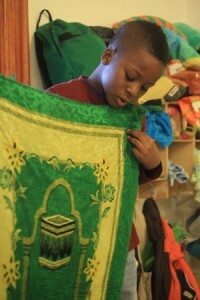 Aziz’s work will be on display at State Representative James Roebuck’s office at 4712 Baltimore Avenue . Stop by to see his window exhibition until winter 2017. The Songs of The Children movement began in 2015. Formed by both current Jubilee students, as well as alumni, the group is a continuation of student activism in response to social injustices. They decided to call their campaign “Songs of the Children: An Album of Voices for Justice” because poetry, among other art-forms, will be used as a message builder. Poetry is a powerful way of speaking. Since its inception, the Songs of the Children Movement has led three marches with hundreds of children to speak out against social injustices and promote working together in positive peaceful communities. 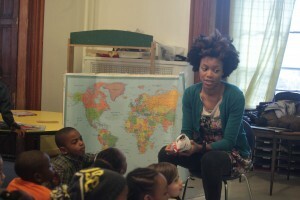 They have been presenting their mission to schools across Philadelphia, and getting children to join the movement. As a part of their study of the issue of police brutality, last year’s students of Jubilee’s fifth and sixth grades wrote a research paper about the police confrontations with MOVE. On May 13, 2016 they decided to visit Osage Avenue where the bombing had taken place 32 years ago. They laid flowers and read poetry, and while they were there, they noticed that there was nothing to tell what had happened to the block, which looks like a war zone. 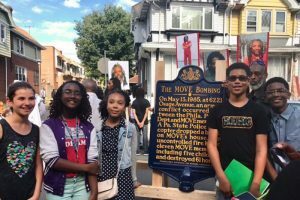 So, they decided to apply for a historical marker to tell the story of how a house with children was bombed, and a neighborhood was allowed to be destroyed by fire. On June 24, 2017, Jubilee organized a ceremony to unveil the historical marker. In attendance were several MOVE members, as well as notable fgures such as Arnett Woodall, Sister Sonja Sanchez, Ursula Rucker, Kindred The Family Soul, and David Fattah. We began the New Year with what we call World Week. We had parents speak from Haiti, he Dominican Republic, Canada and Senegal. We also had student speakers. On Monday, the fifth and sixth grade class presented the history of Haiti from 1492 through 1934 in the voices, and from the points of view of different historical players. On Friday, a fourth grade student whose father is from Senegal gave a presentation, including a brief history of Senegal, along with an introduction to cultural traditions and religious beliefs. This was followed by a visit to a Senegalese restaurant owned by a parent of one of our students. She also gave us an overview of her country, followed by a five course meal. Her five year old daughter danced to Senegalese music, and before we knew it, most of the students got up from their tables and danced with her. As several of our teachers said it was magical, and “a real Jubilee moment”!